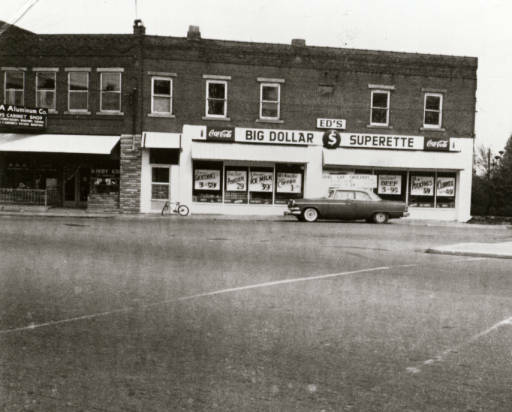 “Ed’s” Big Dollar Superette #1, located at 415 Haywood Road, was only open from 1967-1968. “Ed’s” likely referred to Edna C. Cason, proprietress. This location housed many grocery stores over the years including one of three West Asheville locations of the Great Atlantic & Pacific Tea Co. [1924-1940], Estes-Starnes Grocery , Metcalf Grocery [1947-1950], and Brown’s Market [1953-1965]. Seller’s Cabinet Shop [1947-1965], with AAA Aluminum Co. and Kirby Co. of Asheville all at 417 Haywood Road, can be seen on the left side of this photo. These businesses were operated by Paul G. Sellers who lived upstairs.